Local Insurance Leads and Getting An Unfair Advantage! Generating local insurance leads using simple online marketing techniques can be a very effective way to build your agency. Do it right and you can get an unfair advantage. Local online insurance lead generation is a marketing strategy that you can use starting today to get more insurance leads coming your way so you can build your list and get new clients. A local insurance lead generation campaign is recommended to really get a snow ball effect, but for sake of this article lets keep it simple and focus on a basic online tools, shall we? 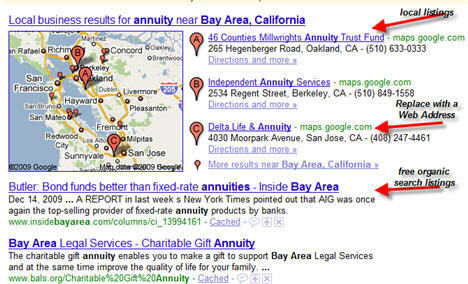 Ok, first you should take advantage of the Google Local Business Center to get free local insurance leads and prospects. Make sure that your listing is up to date. If your address and pictures are not up to date get it done. But that's not all. When you follow Google's system Google will ask you for pictures, videos, services, descriptions, and you can create coupons as well. Take advantage of all of those and load it with pictures and videos and descriptions. Why? Because Google wants to see that you have up to date information and content, and them more content you have the higher you'll rank on the Google local search results. And it's FREE! Go right now to your computer and see if your office ranks (even if you work from home). If you are not listed or the listing is in accurate you are probably missing out on local insurance leads. More and more people are focusing on local businesses to solve their problems. So when someone types in local insurance agent, or Name Of Town or City insurance agency, or local insurance quote...anything like that...you want to be ranked in the local search results so you can generate free local insurance leads. You are not going to get bombarded with leads from this tip, but it will help you. The example to the right are two listings and statistics taken from the Local Business center. All the 'actions' are potential leads, and the are all FREE! 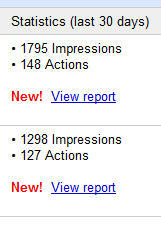 As you can see, there are many impressions. And not everyone is going to see your listing. They are going to be distracted by Google Adwords (advertisements) above and to the right of the local listings (see screen shot above), as well as the search results which are just below the local listings. This tells you that you need to do more local marketing to generate local insurance leads from the impressions (more on this later). So that is the first thing to do, OK? Second, like I mentioned above, you should get some video created. It doesn't have to be a Steven Spielburg production. As a matter of fact, you can get it done inexpensively, and you don't even have to talk. You can create a really nice video using pictures. But you should have at least one with you talking so people can get a feel for you. This local insurance leads video will help you in the Google search results, and it will help you in your advertising (more on this later). If you want us to get your Google Local Business Center optimized let us know and we can do it for just $150. That does not include a video. If you would like us to do the video using pictures we can arrange that as well for a small fee. Their are a few more important online marketing areas you should focus some attention on. If you would like a short course on local marketing, be sure you are on our list to be notified when it is ready.